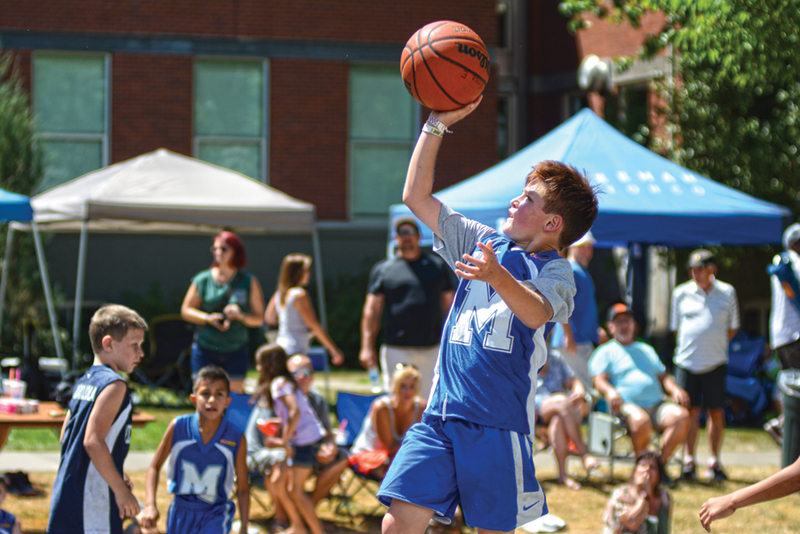 Every team that signed up for Hoopla, a 3-on-3 street basketball event on Aug. 5-6 in downtown Salem, was guaranteed at least four games. Most of the 17 squads representing Keizer played many more. Bronbron Squad, a team made up of McNary incoming freshmen, had the most success. Nate Meithof, Gabriel Martinez, Landon Moore and Eli Petilo went 3-0 in pool play on Saturday and then won four tournament games on Sunday to capture the 14-and-under boys recreational championship. McNary sophomores Junior Walling, Nick Zuro, Peyton Kreitzer and Riley Flores, playing as Big Ballers, also won their first six games to reach the finals, but lost to Bucket Squad 29-27 in the championship game of the 15-and-under recreational division. Two teams made up of recent McNary graduates clashed in the semifinals of the Men’s Division-III bracket as Trent Van Cleave, Jared Van Cleave, Tregg Peterson and Kyle Cooper got the best of Adam Harvey, Alex Martin, Hayden Sader and Matthew Ismay. The winning McNary alumni then lost to KEY Home Furnishings 31-23 in the finals. More current McNary players also participated. Andrew Jones, Chandler Cavell, Lucas Garvey and Daniel Zwemke went 3-0 on Saturday. Playing as Big Baller Brand, they won their first game Sunday before losing the second 35-29 in the 17-and-under competitive boys division. Garvey also joined a team of McNary football players, David Alfaro, Hakam Nagra and Jakoby Doke, in the 17-and-under recreation division. JLHD went 2-1 in pool play and then lost to Clash of Clans West 21-15 in their first tournament game. Another team of McNary basketball players, Alfredo Villarreal, Griffin Oliveira, Jacob Jackson and Jason Elliu finished 2-1 in pool play of the 16-and-under competitive division. They won their first game Sunday but lost in the second round, 30-27, to Good Times. A group of Lady Celts, Sabella Alfaro, Regann Donahue, Lexi McKay and Ellie Bemrose, were in the 15-and-under girls recreation division. Playing as Dutch Gang, the girls went 1-2 in pool play but rebounded to win their opening tournament game 16-13. They then lost 12-10 to MVP Plus T in the second round. Eight teams made up of future Celtics also made their mark. Capitol City Ballers (Alejanrdo Gonzalez, Brandon Stinnett, Ethan Wollangk and Tony Correa) went 3-0 in pool play and won their first tournament game before losing to Catch and Shoot 35-32 in overtime of the 12-and-under competitive semifinals bracket. The second round tripped a lot of Keizer teams up. Celts 14-and-under (Benjamin Roth, Carter Nelson, Isaac Johnson and Kyle Martin) went 2-1 in pool play. They edged Springfield Millers 24-23 in the first round of tournament play but lost another close game, 34-31, to Scot City in the second round. Celts 12-and-under (Ben DeVos, Connor Roop, Jackson Alt and Kobe Villarreal) went 1-2 in pool play but bounced back with a 18-14 victory over Off the Couch in the first round of tournament action. However, the Celts then lost to Upper Class Athletes 26-13. In the 10-and-under division, Keizer Attack (Kanon Kintner, Aydn Dallum, Konner Cleveland and Teagan Brown) went 2-1 in pool play, which included a 15-13 win in the closing seconds. The boys then easily won their first tournament game before falling in the second round 23-20 to Razors. The Keizer Warriors (Gavin Aguilar, Karsten Ostrom, Steven Adams and Vincent Estrada) got off to a blazing start, going 3-0 Saturday and then winning their first tournament game 28-7. However, their run ended in the second round with a 27-26 loss to Cherry City Ballerz. Keizer had three 11-and-under teams. In the competitive division, Keizer Elite 2025 (Kaden Donahue, Kyler Donahue, Landon Ostrom and Noah Dallum) finished 1-2 in pool play and then lost to Dream Team Fly 35-25 in the opening round of the tournament. In the recreation division, K-Town Ballers (Pierce Walker, Ryan Lyda, Gage Smedema and Carter Hawley went 3-0 on Saturday and easily won their first tournament game. However, they too lost in the second round to WA-OR Friends 35-23 on Sunday. Keizer Clutch (Elijah Clendening, Kelson Whalen, Maguire Montgomery and Ryder Symington) finished 1-2 in pool play and then lost to The Little Hoopsters 23-18 in the first round of the tournament. K Town Benchwarmers (Gunner Smedema, Hayden Kaiser, Tyler Copeland and Zane Aicher) went 2-1 in pool play of the 14-and-under division. They then lost in the first round of tournament play. Around 4,000 players on 1,000 teams participated in the 19th edition of Hoopla, which is believed to be the second largest event of its kind in the country.